Nineteen South Korean Christian aid workers freed by the Taleban after six weeks in captivity have apologised to the nation for the trouble they caused. The former hostages, who had travelled to Afghanistan against government advice, said they owed their compatriots an enormous debt. The group arrived home on Sunday. Two of the original 23 hostages were murdered and another two freed earlier. South Korea's government denies reports it paid a ransom for their release. Carrying portraits of their two colleagues killed by the Taleban, the former hostages looked pale and tired as they faced the waiting wall of television cameras upon their arrival at South Korea' s Incheon airport. "We apologise to the people for causing trouble and thank everyone who helped us return home safely," one of the 19, Yu Kyeong-Sik, said. "We owe the country and the people a great debt." He cried as he paid homage to their two slain colleagues, saying "we will live our lives for them". 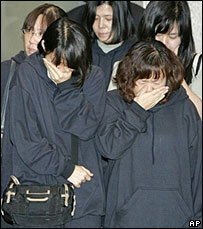 Mr Yu said that the 19 only heard of the deaths of their colleagues when they were released earlier this week. Their body language in the arrivals hall - contrite bows and a carefully prepared statement - showed an awareness of the criticism they are facing at home, says the BBC's John Sudworth in Seoul. The former hostages were reunited with family members as they had medical checks after leaving the airport. Their release was negotiated by South Korean officials, who had face-to-face meetings with the Taleban this week. Ransom allegations have been made by a number of Afghan officials. A Taleban representative in Ghazni province, where the hostages were held, told the BBC the South Korean government paid $20m (£10m) but two other Taleban sources told the BBC no ransom was paid. There are strong indications that money was paid, correspondents say, although the sum is likely to have been considerably lower - Afghan officials have said a sum slightly under $1m (£500,000) was handed over. South Korea has denied the claims. Seoul said it agreed to pull its troops out of Afghanistan as scheduled by the end of the year, and stop missionaries travelling to Afghanistan. The BBC's Alastair Leithead, in Kabul, says the Taleban appear to have succeeded in this case - getting away with a kidnap and having their demands met. There are now heightened fears that more kidnappings will follow, our correspondent says. Their church has insisted the 23 Christians were doing aid work and were not involved in missionary activities.